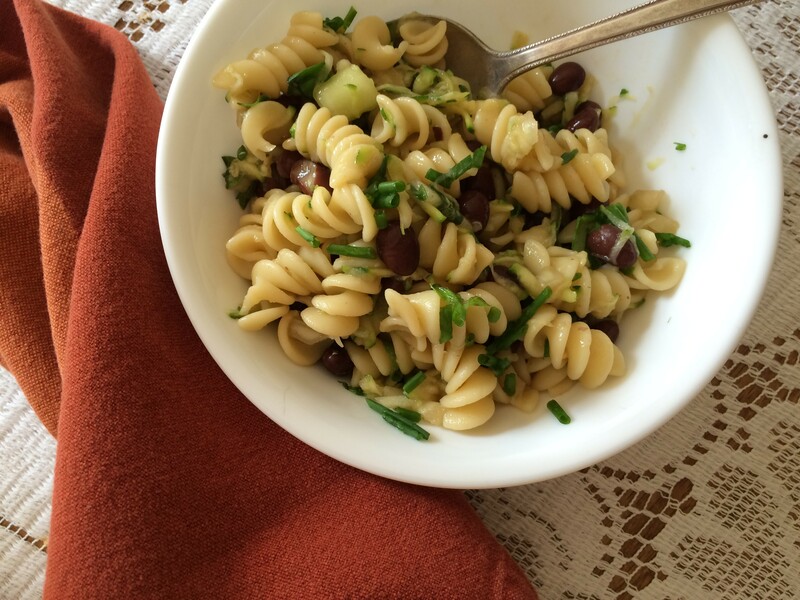 A few weeks ago, I threw this simple pasta salad together for a potluck. I've been craving it ever since — it's a little sweet, nice and salty, and very light, as pasta salads go. It's also vegan, and if you use gluten-free pasta and Bragg's aminos, it's also gluten-free, which means most everyone at the party can eat it. Last time, I included chopped sugar-snap peas from LePage Farm, but those are mostly done for the season. This week, I substituted shredded summer squash (and cucumbers) from Pierson Farm's stand in Bradford, since here we are again in the zucchini heart of summer, and it's time to start adding squash to everything. Cook pasta as directed on the package, then bathe in cold water until it cools completely. Drain and reserve. Place the black beans in a large, non-porous salad bowl. Cut the veggies to size and add each to the beans as you finish. Sprinkle the bean/veggie mix with salt and tamari and let sit a few minutes, stirring occasionally. Then add the oils, acids and ginger and stir until all are well combined. Let the veggies marinate in the liquid for five to 10 minutes; some liquid will collect at the bottom of the bowl — mix to redistribute it. Add the chopped herbs, then the pasta and stir until everything is well combined. Let rest a few minutes, then stir again and serve.